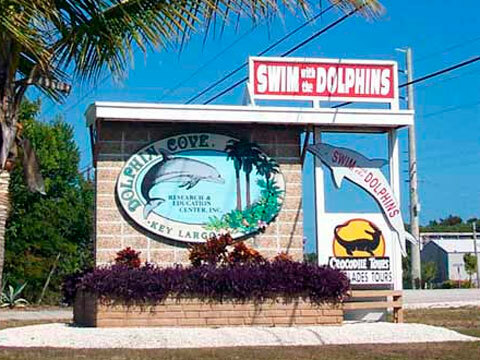 Dolphin Cove is a marine education and dolphin swim facility located in sunny Key Largo, Florida. Visit us in the Florida Keys and swim with dolphins in our natural lagoon open to the Florida Bay. Our dolphin swims are available to the public throughout the year and are a great addition to your Florida vacation. Our Natural Dolphin Swims are a freestyle snorkel program. Our dolphins set the pace! The dolphins are not doing trained behaviors in this program. Our goal is to keep these dolphin encounters as natural as possible. Swimming with dolphins on their terms means interacting in a more natural way with eye contact and synchronized swimming. If you would like to see the dolphins in a more natural setting while observing their grace, beauty, fluidity and curiousity, then this is the program for you! Swimmers will be able to observe the dolphins around them, but not to reach out and touch them. Any contact that occurs must be initiated by the dolphins. In-water time is 30 minutes. Snorkel gear is provided. Enjoy our Florida Everglades Tours and Flamingo Express private charters departing from our key Largo facility. Structured Dolphin Swims begin with a 30-45 minute educational briefing aboard one of our Everglades tour boats. During this time you will be able to observe the unique beauty of our back country while learning about dolphin natural history, intelligence, anatomy, and important information about your upcoming dolphin encounter. Dolphin swims take place in our natural lagoon. Swimmers will take turns entering the water and interacting hands-on with our dolphins. All interaction is guided by a dolphin trainer, and one on one contact is guaranteed. The Trainer for a Day program offers a behind-the scenes look at our marine mammal facility and first-hand experience of what an animal handler’s day is like here at Dolphin Cove. Accompanied by one of our Dolphin Trainers, participants enjoy a busy half-day of fun activities: Participants will learn the basics of dolphin behavior and training, learn about food preparation with a fish kitchen experience, observe two feeding sessions and a Structured Dolphin Swim session, attend an educational briefing, have a brief hands-on dolphin encounter, participate in a Natural Dolphin Swim , and receive a Dolphin Cove T-Shirt as a momento.